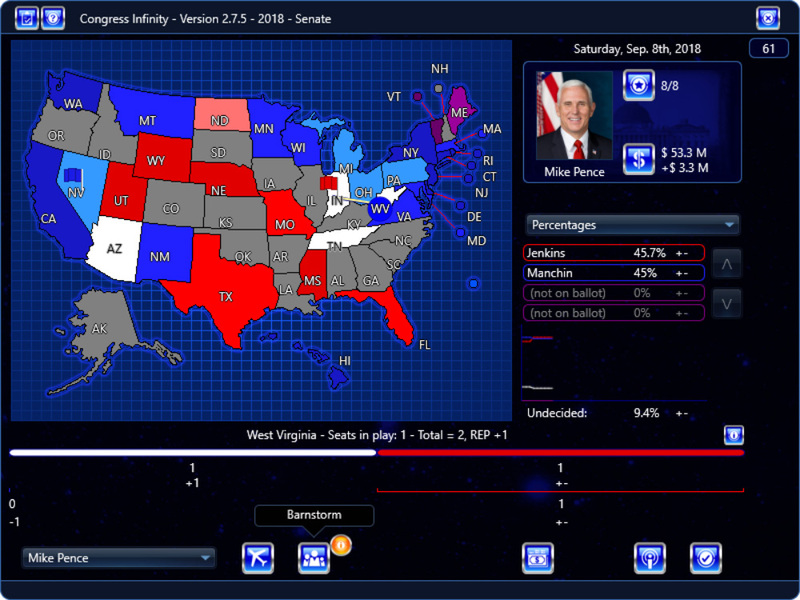 The definitive Senate and House election game for 2018 and beyond! 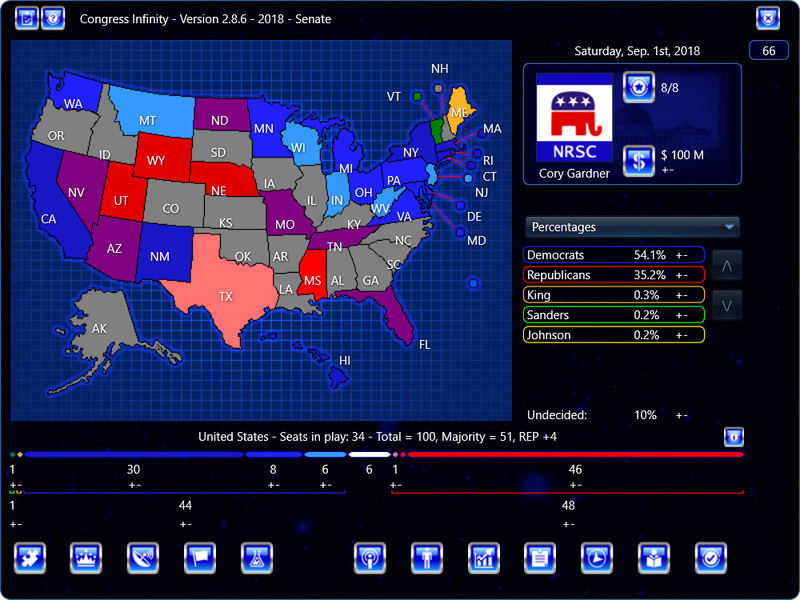 Battle for control of the Senate or House in our groundbreaking House and Senate election sim. 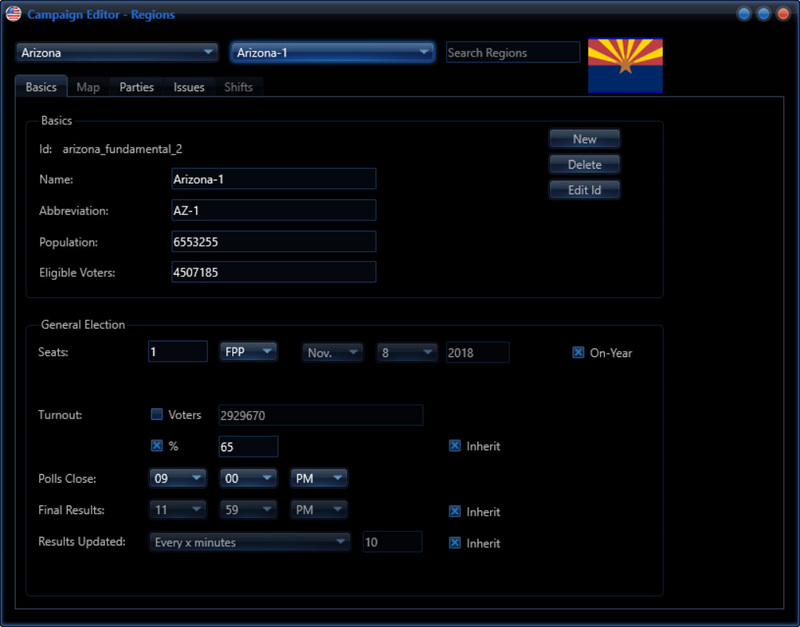 Play the 2018 Senate campaign or 2018 House campaign, 2016 Senate and House campaigns, 2014 Senate or House campaigns, 2012 Senate campaign, 2010 Senate campaign, or use the full Campaign Editor to modify campaigns or create your own campaigns! Congress Infinity is available for Windows (7, 8, 8.1, and 10, including the Surface 3) and Mac (macOS 10.8.5 and above). Owners receive the latest release immediately by download. If you’re also interested in other Infinity games, you can see current special offers here. If you have any questions or feedback, please don’t hesitate to contact us. Thank you for supporting these sorts of games! Battle for control of the Senate or the House. Can the Republicans increase their majority in the Senate seats, taking key battleground states, and perhaps even get 60 seats for a filibuster-proof super-majority? Or can the Democrats push the Senate into blue territory, creating a large block on President Trump? In the House, can Republicans expand their majority, or will the Democrats be able to take a majority? 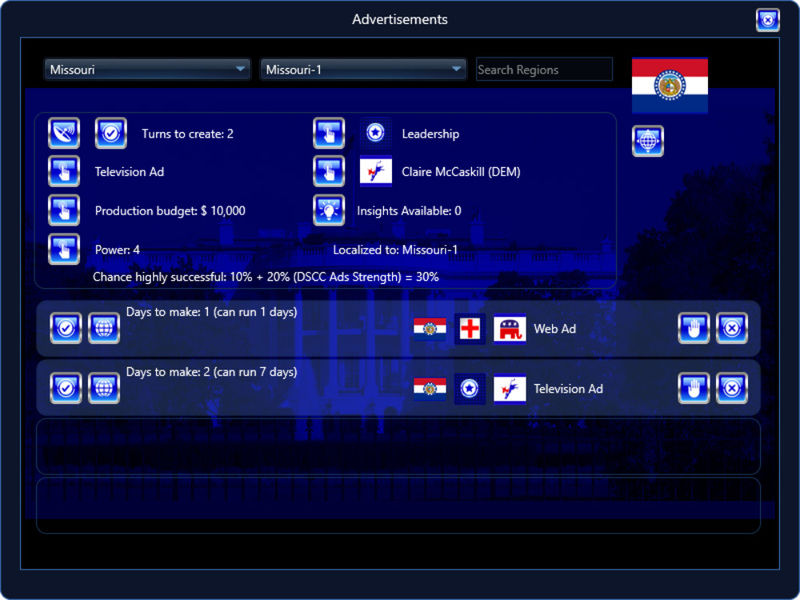 Craft ads nationally or down to the specific seat, gaining regionalized bonuses and lifting up your candidate or dragging down your opponent. Send national resources to buttress campaigns at the seat level, or decide when it’s time to pull the plug and focus somewhere else. Direct your national-level surrogates, telling them where to go and what to do. Should Gov. Mike Pence help Rep. Blackburn in Tennessee, help take West Virginia from Sen. Manchin, or head to one of the national cable networks and spin? Surrogates have regional and personal strengths. 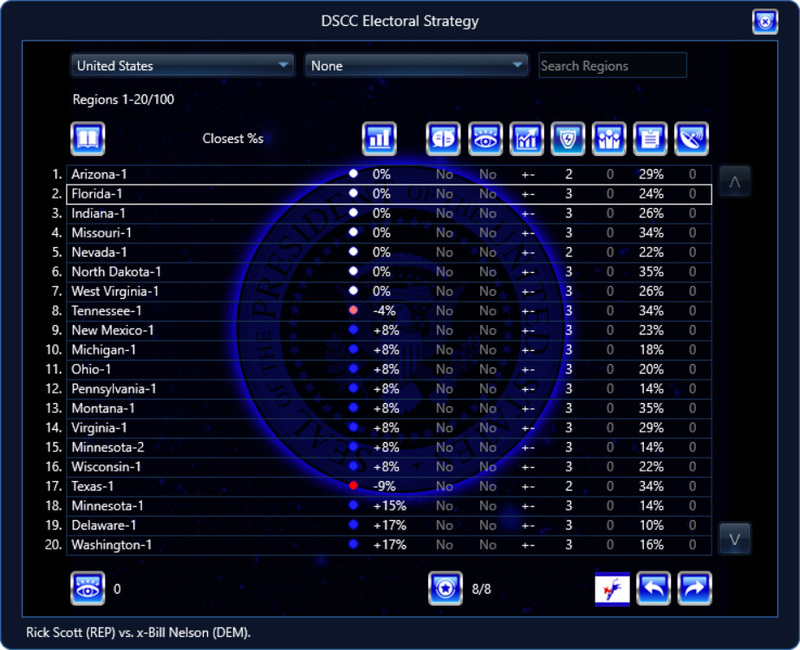 Hone your national strategy, targeting states to increase your effectiveness and wisely allocating limited resources in money, command-and-control, and political influence on a race-by-race basis. Expose corruption on the national Republican or Democratic operations, or dig up scandals on specific candidates and then fan the flames until the story bursts forth on the national scene. 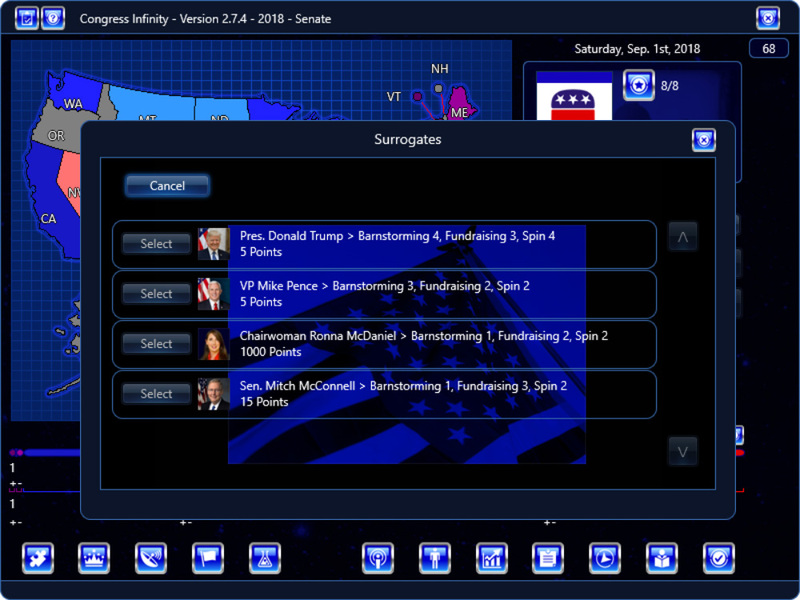 Congress Infinity contains a full Campaign Editor, giving you the ability to modify Senate or House campaigns, or create your own. 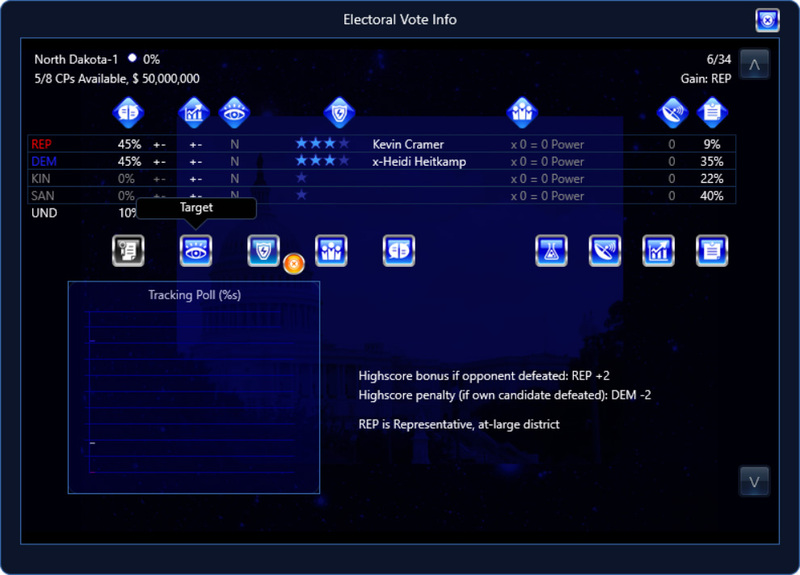 The game also includes Super PACs, party platforms, foot soldiers, and more. Congress Infinity contains the 2018 Senate and 2018 House campaigns, 2016 Senate and House campaigns, the 2014 Senate and House campaigns, the 2012 Senate campaign, and the 2010 Senate campaign. Once purchased, you can download the latest release immediately.